I’ve been receiving a lot of questions and requests about my skincare and make-up secrets for quite some time now so I decided to make this post. Before I share with you what little knowledge I have of make-up (seriously, I still get so surprised whenever someone requests for a tutorial), let me share with you my skincare routine first. After all, great make-up starts with healthy skin, right? I use the Shu Uemura Cleansing Oil to cleanse my whole face only when I have heavy make-up on, like when I come from events or photoshoots. Otherwise, I use it mainly for eye make-up removal on normal days. Heavy make-up or not, I always follow it up with my usual cleanser from Proactiv. I get paranoid like that. Notice that I only use the Revitalizing Toner and Repairing Lotion from Proactiv during night time. This is because I find them too harsh or strong to be applied twice daily. My skin tends to have dry patches whenever I do, so I only use a small amount of these two products. Just a friendly advice, no matter what toner you’re using, avoid contact with your undereye area. The skin under your eyes is too delicate for toners, you don’t want to dry them out and cause wrinkles. 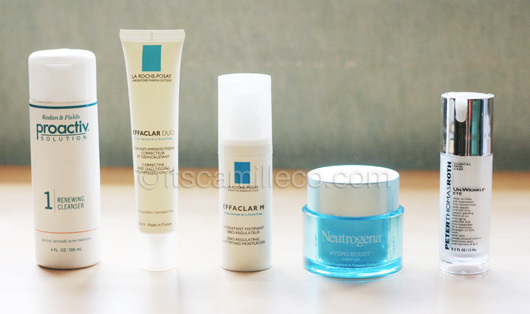 For pimples, I use Duac. It’s a combination of Clindamycin and Benzoyl Peroxide. Not all skin types can handle Benzoyl Peroxide-based treatments so make sure to test it out first. Although I have to say, Duac is a really good product. It’s not like the other Benzoyl Peroxide-based treatments that cause dark spots. It’s highly recommended by my dermatologist. You can buy Duac in all Mercury Drugstore outlets, just go to the area where they sell pills and prescription drugs. Another good product is the Mario Badescu Drying Lotion, available in Rustan’s. My sister and I used to use it. It’s really effective in drying out pimples and it really works overnight. 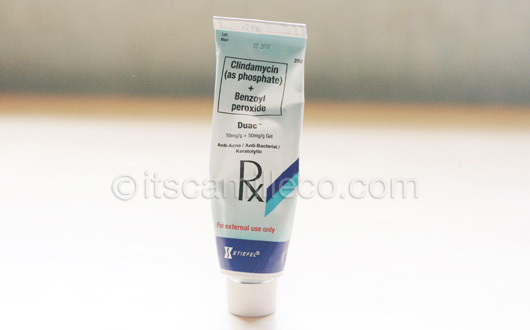 You might want to check it out too if you’e skin is not compatible with Benzoyl Peroxide. Lastly, speaking of skincare products, I might just add another one to the family. I received this new product called Vitacreme B12 just a few weeks ago. According to my research, it’s a miracle product from Switzerland and is really famous in Japan. It’s most famous for removing scars caused by acne or insect bites, fading darks spots like freckles, diminishing age lines and wrinkles and improving skin elasticity and firmness. It’s supposed to hydrate your skin and improve its over-all appearance, giving you a certain glow. From the reviews I’ve read, it looks like it’s an amazing product. I can’t wait to use it! Vitacreme B12 is available exclusively at Watsons. For those who are asking for a store who sells effaclar products i fnd one store here in taiwan and its all compete but very expensive hahahha.. Updated skin care routine! Pretty please (: pag may time. Parang nothing changed naman so much! :) Pero sige one day! Ohhhh that I’m not sure of. I usually get mine at Hong Kong. :( Have you tried asking dermatologists? Maybe they would know :) I’m so sorry I’m not much help! im a student .. umm can you recommend some cheap but good beauty products? Hi Camille! :) Just wanna ask if how much is the Duac? You can buy it on Mercury Drug right? :) Hope you answer. Thanks. :* Stay stunning.